Since January, nearly every film I've gone to has forced me to watch one of the same two repetitive trailers for Oblivion. Here I am, the trailers said, the movie you didn't ask for, the movie in which Tom Cruise plays a human Wall-E and flexes his Everyman muscle by putting on a Yankees cap and talkin' football on a post-apocalyptic planet. I resented those trailers just as I tend to resent Hollywood's insistence in casting Tom Cruise, repeatedly, as an action figure-sized hero. Resentment, though, only goes so far when you're a cinephile with a taste for science fiction. From Oblivion I sensed something other than just another repetitive, robotic action film, and so I surprised myself by deciding to go and see it. As the film wore on, I surprised myself further: I liked it, really, quite a bit even as I immediately recognized some of its more obvious flaws or was irritated by its rigid adherence to generic conventions. Since seeing the film, I've been trying to sort out exactly why it is that I can't seem to hold the film's faults against it, and why it is that my sense of its winning qualities seems to be a very unpopular opinion. Critical audiences seem to actively want to hate Oblivion, but their quippy loathing seems oddly misguided. There are problems with Oblivion, yes, and it's best to acknowledge a spoiler-free smattering of them right away. Oblivion opens with an extended, forced first-person voice-over devoid of context. As some have noticed, it's completely unnecessary as the information is rehashed later in the film, yes, but it's perhaps most unnecessary because it's simply unfounded. We're meant to believe that Jack Harper (Cruise) is recording a sort of oral diary chronicling his time spent as a drone technician on the desolate remains of Earth. Jack lives in a luxurious 2-person base camp with his communications officer Vica (Andrea Riseborough), and the first hour or so of the film is devoted to capturing a sense of the isolation, monotony, and sterility of this bleak future. Each morning Vica fires up the connection with their control center contact Sally (a creepy Melissa Leo) and Jack flies down to the surface to repair weaponized drones on the decimated remains of the American northeast coast. We learn quickly that there's little room for real emotion in this world, and no space for questions. Jack's recorded voice-over is all but impossible, but also thoroughly unnecessary as anything but a cheap attempt to rope in an audience that may not take kindly to a slow open. Without revealing any more than that one repeated trailer did, I can tell you that Oblivion is awash with complications by the time the credits roll. There are small twists that pull at Jack's reality that layer into much larger questions on humanity, memory, and identity; and yeah, Morgan Freeman is thrown into the mix. The number of pieces and themes gets to be a little much, and the film is often rather heavy-handed as it tries to deliver big picture allegories on too many topics. All of that makes Oblivion a bit exhausting, and likely rather frustrating for viewers less interested in the fantastic, myth-making quality of science-fiction and more apt to be engaged with a realist, toned-down approach. Yes, it has a couple light logic issues. Yes, if you're sick of Tom Cruise, that could be a problem (though Cruise pulls off his the action hero role more effectively than he has in years here). Yes, there are points at which you'll feel like it punched you in the face with its big picture 'point'. The film is directed by Joseph Kosinski, a man who I'd wager has a genuine sci-fi masterpiece in him somewhere (though who knows, this could turn out to be the one a few years down the line), and who seems deeply influenced by the speculative science fiction of the 1970's and early 80's. Oblivion is touched by the old school. It's a highly stylized vision in rounded white edges, shiny glass surfaces, and glossy finishes. The film is a pristine collection of cinematographic stills, and the landscapes are frequently touched by a heavenly quality that makes the repeated refrain, the lonely "another day in paradise" seem apt. Kosinski knows how to balance the human with the mechanical. He did this in a very literal way in the gorgeous (but relatively vapid) Tron: Legacy between programs and users, and he enacts that balance here to create a difference between Vica's view of her role and Jack's growing uncertainty. Ultimately, it's a beautiful vision, and one very much in keeping with the old school works of science fiction before it. Kosinski is working his way towards something that breaks from past models. He began with a brilliantly stylized sequel of established, kitschy material and has jumped to a large-scale, heartfelt pastiche of past influences; his next step could be anything, and it seems only a matter of time before he releases something truly, immediately original. 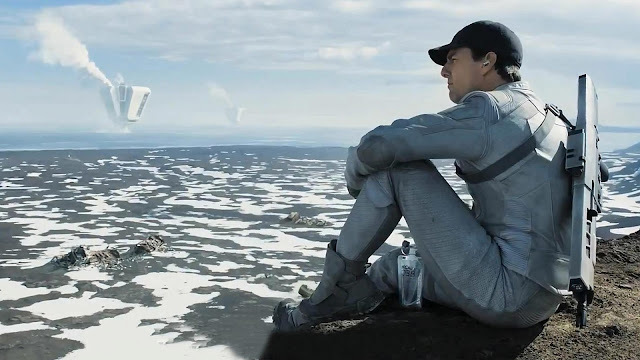 For now, though, Oblivion is a science fiction film deserving of real science fiction fans. I went into the theater expecting just another big, rollicking Hollywood affair and found something that has some action, yes, but which took its time, built its characters, and thought about the vision of the world it was building for more than just a moment. The visuals here are magnificent, but the vision is one ripe with potential. Let's put it this way, science fiction has never been the most subtle of genres (though there are examples within the genre that succeed in being so), and Kosinski is playing with material and images plucked from the best and brightest; 2001, Solaris, Blade Runner, The Matrix, Logan's Run (yes, I put it there). It's a new song built from old songs, a new story influenced by the old masters. As such, it's a prime candidate for reevaluation down the line. Don't write Oblivion off just yet.